Grand Forks Air Force Base, North Dakota. The 447 MS was equipped with the LGM-30G Minuteman III Intercontinental ballistic missile (ICBM), with a mission of nuclear deterrence. With the end of the Cold War, the 447th was inactivated on 30 September 1998. Activated in mid-1942 as a B-25 Mitchell medium bomber squadron, it was trained by the Third Air Force in the southeastern United States. It deployed to the Mediterranean Theater of Operations (MTO), being assigned to the Twelfth Air Force in Algeria in early 1943. While in North Africa, the squadron engaged primarily in support and interdictory operations, bombing marshalling yards, rail lines, highways, bridges, viaducts, troop concentrations, gun emplacements, shipping, harbors and other objectives. The squadron also engaged in psychological warfare missions, dropping propaganda leaflets behind enemy lines. It took part in the Allied operations against Axis forces in North Africa between March and May 1943, the reduction of Pantelleria and Lampedusain islands during June, the invasion of Sicily in July and the landing at Salerno on the Italian mainland in September. The squadron was also involved in the Allied advance toward Rome during January–June 1944, the invasion of Southern France in August 1944 and the Allied operations in northern Italy from September 1944 to April 1945. On 11 November 1944 the aircraft pictured (right) was part of an 18 aircraft formation which attacked three enemy troop convoys and dropped fragmentation bombs on them while attempting to move though the Brenner Pass. The aircraft was hit by ground fire and about 60% of its right vertical tail was blown off. However, the Mitchell was able to return to its base on Corsica with only a single working rudder. The squadron was inactivated in Italy after the German capitulation in September 1945. 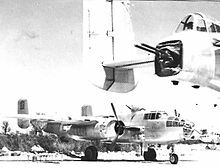 The squadron was re-activated as part of the Air Force Reserve in 1947 and equipped with A-26/B-26 Invader medium bombers, then inactivated in 1949 due to budget cuts. It was reactivated in 1953 as a Strategic Air Command (SAC) Boeing B-47 Stratojet squadron. It trained in air-to-air refueling and strategic bombardment operations with the B-47. In 1961, the squadron began transferring its B-47s to other SAC wings and became non-operational as part of the phaseout of the Stratojet. On 1 November 1963 the 447th Strategic Missile Squadron was organized as a SAC LGM-30F Minuteman II intercontinental ballistic missile wing. It was activated on 1 Feb 1965, and was the first unit to place the Minuteman II on alert status in January 1966. It became fully operational on 7 December 1966, with a complement of 50 missiles. It participated in “Project Long Life II,” a unique reliability test in which modified Minuteman missiles were fueled to travel a few hundred yards. The first launch from a silo occurred on 19 October 1966 and was declared unsuccessful. Nine days later, a second attempt also failed. A third attempt under “Project Giant Boost” occurred in August 1968 and again proved unsuccessful. The squadron converted to LGM-30G Minuteman III missiles from December 1971 to March 1973. These missiles represented a significant technological advance, having multiple independently targetable reentry vehicles (MIRVs). Coordinating the missile changeover required complex planning and execution. With the restructuring of the Air Force and the disestablishment of SAC in the early 1990s, the squadron was reassigned to Air Combat Command (ACC) in 1992 and then came under Air Force Space Command (AFSPC) in 1993. In March 1995, the Base Realignment and Closure (BRAC) Commission selected the 321st Strategic Missile Wing for inactivation. The squadron was ordered to securely transfer its alert responsibilities to the 341st Missile Wing at Malmstrom Air Force Base, Montana. It maintained nuclear alert until inactivated in 1998, nearly 40 years after it first went on alert. Narducci, Henry M. (1988). Strategic Air Command and the Alert Program: A Brief History. Offutt AFB, NE: Office of the Historian, Strategic Air Command. Retrieved 18 February 2018.